I’ve just returned from Imagicon in Birmingham, Alabama! While my personal artist alley sales were modest, enthusiasm from artists and congoers was pretty high all weekend. I get the feeling from the amount of curious and perplexed parents peering in at us from around the corner that the scifi and fantasy fandom is still a little new in the area. Come buy my shinies! Or my evil eyes will get you! Or perhaps it’s because the main part of the con was held in the middle of exhibits nestled in the belly of the McWane natural science center in downtown Birmingham? Most people were there to let their kids bounce around interactive exhibits and maybe learn something scientific along the way. This was good in that we got a lot of foot traffic from museum-goers, bad because many of them weren’t interested in the art show or dealers room and had no clue why they were standing next to an Alien in the elevator wondering whether they should cover their children’s eyes or not. In truth, there weren’t many signs that even mentioned Imagicon was there. No signs outside the building and most of the noticeable signs tacked up by the elevator which said the 3rd floor was closed for Imagicon, sending mixed signals. There was even less signage to indicate the location of the art show, though due to the art staff’s quick thinking, computer printed signs appeared around the 2nd day. 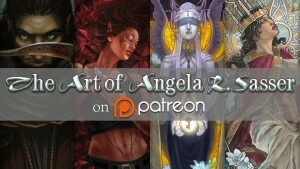 Even still, the traffic through the art show was minimal and I only sold a single piece (Archangel Uriel, which persists as my top seller, despite being an old piece). What really made my weekend was shmoozing with other artists in the show who attended the panels. I felt like we were really able to give people good ideas in the website development and business panels, even if the number of artists hosting the panel on business outnumbered the people in attendance. It’s a great feeling to be around all these other folks making a living doing the same business of art and convincing one another that we’re not insane for it! I took some great notes on art licensing at Ash Evans‘ panel, who is an inspiring professional and outspoken lady. I met a couple of ladies who also recognized my Ezio mask from the LeatherMaskArt group on DeviantART. Such a small world, it is! I put my mask to a stress test wearing it all day Saturday and even walking down the street to a hotdog stand, receiving many strange looks along the way. It was a good draw for my table, even if only a special few recognized its inspiration. All in all, the show has a good heart, but just needs to work out it’s advertising and signage a little better. Art show staff was helpful and receptive and I’m sure the show is going to get more traffic as they improve their setup, especially with the enthusiasm of those involved in its management. I hope that if budget allows, I’ll be able to attend again next year! Stay tuned for a little video I put together on what we packed for the convention. It will be up on my YouTube channel shortly! This has been your con report from Angelic Shades. Sasser signing off! Thanks for the report! It is interesting to hear about shows and cons and what the real problems are. I hope next year the organizing committee pulls it off better for the same of the artists.